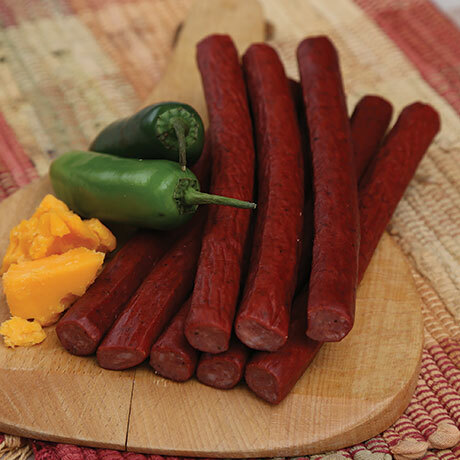 Venison and pork mixed in a special blend of spices make this one amazing snack! Seven 1-ounce sticks. PORK, VENISION, CHEESE [PASTEURIZED PROCESSED CHEDDAR CHEESE (CHEDDAR CHEESE ((CULTURED MILK, SALT, ENZYMES)), WATER, CREAM, SODIUM PHOSPHATES, SALT, VEGETABLE COLOR, ENZYMES)), POWDERED CELLULOSE, POTASSIUM SORBATE AND NATAMYCIN], SALT, DEXTROSE, SPICES, JALAPENO PEPPER, WATER, CITRIC ACID, GARLIC, SODIUM ERYTHORBATE, STARTER CULTURE, SODIUM NITRATE. STUFFED INTO BEEF COLLAGEN CASING FD&C RED #3.